Sup Ch Mai-Thai Ariel aka "Nah"
Ch Koosje van Tutte's Die Kaapse OORkapi (Imp) aka "Kapie"
My house is not the same without him. Kapie was such a sweet natured boy. I miss him so much!!! 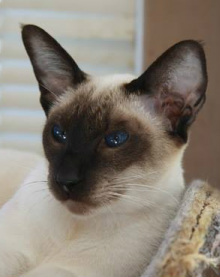 His legacy lives on in his only Siamese son "Olly". It is with a very heavy heart that I announce the sudden passing of my beloved Coco. Coco developed complications after a spay and I had to make the very difficult decision to have her put to sleep. She was so special and loved having babies and mothered any kitten in sight. Thank you Tony & Ivone for trusting me with Coco. She was by far the best brood queen I have ever been privileged enough to own! Coco attained her Distinguished Merit title in 2011. Ch Mutti's Lilaque Star aka "Minx Binx"
Minx was my first Siamese broodqueen. Minx had only two litters in her breeding career - she gave birth to 7 kittens via caesarian in her first litter (5 survived) and 6 in her second litter (also via c-section). Unfortunately after two caesars I had her spayed. I kept Billy from her first litter and Gutsy from her second litter. She loved "mothering" the babies in the house and I would constantly have to remove her from the breeding box! She got on with all the other cats in the house and never fought with anyone. She was closest to her daughter Gutsy. In recent months I noticed she was losing weight and drinking lots of water. I took her to the vet and after blood tests the vet diagnosed her with chronic renal failure and she was hospitalised and rehydrated. Despite the tablets and fluid therapy she continued to lose weight and eventually stopped eating altogether. I decided the kindest thing for her was to end her suffering and have her put down. Thank you Marlene for entrusting me with Minx. Sup Ch Mai-Thai Koosje van Tutte's Alive & Kitting (Imp) RQ aka "Alfie"
I imported Alfie in September 2006 I knew from the first pictures that his breeder Koos Hendriks sent me that he would definitely be a much needed asset to the quality of Siamese I aimed to breed. 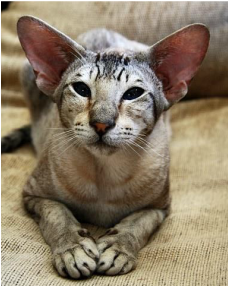 He has succeeded in improving the eyes (shape, colour and set) in his progeny which for me has improved the whole expression of a true Siamese. He has produced many show winners to date. From his very first litter with Gr Ch MyEden’s Coco Chanel DM – Sup Ch Mai-Thai’s Ariel and Sup Ch Mai-Thai’s Alessandra (owned by Liz Rohland at Kia-Ora Siamese). Alfie is also the sire of COTY 2008 Kitten Qualifier Gr Ch Tamarind’s Valentino (Chocolate Tabbypoint Male Neuter) owned and bred by Ian Moore. Others include Gr Ch Mai-Thai's Brown Sugar and Gr Ch Mai-Thai's Glamourous. He lives on in his babies forever! Billy (a.k.a Bills) was born via Caesarian Section on my birthday on 29 September 2004. He was one of 7 kittens born from my first litter ever. 5 kittens survived - 3 boys and 2 girls. Having always wanted to breed a nice lilac point male I decided to keep him over his lilac brother as he was of better type. He also stole our heart with his laid-back personality. Billy was a gentle giant and everyone that visits the cattery commented on his size yet he remained elegant. Billy loved helping raising all the babies in the home even licking their bums and teaching them how to play. Billy did well on show winning Best Siamese Neuter and Best Lilac Point Siamese on Show at the Burmese Interest Group Show in August 2005. A couple of weeks ago he suddenly developed sudden onset lameness in his right forelimb. Fearing he had injured it we were instructed by the vet to rest him. Little did we know that this was the first sign that he was suffering from an underlying heart condition. Not long after regaining the use of his limb he developed sudden onset paralysis of both his hindquarters. He was diagnosed with Hypertrophic Cardiomyopathy (via a specialist heart scan) which caused the saddle thrombus and subsequent lameness. Even after all we did to keep him going Billy succumbed to his illness less than a week later. Absy gave birth to a litter of 5 kittens end of August 2009. Tragically Absy died on the evening of 9 November leaving kittens in her wake. She is sorely missed by the Tennison family. Absy’s legacy will live on in her kittens one of which Colette has kept - Grand Premier AbFab's Andy's Bandit.